Nonetheless, that’s a lot of choices. And when we consider the impact those choices can have in our lives, in other people’s lives, and well, for all of eternity, it is humbling. And it requires realignment. Often. When we choose to follow Christ, this choice is not made once. It is made moment by moment as we seek to determine in the many choices of each day whether or not the choice at hand honors God. One choice that is “a biggee” in life is where we will choose to live. There’s Joshua, who took the portion God had for him. There’s Abraham, who took whatever was left after his nephew made his choice. And then there’s lot. No pun intended, I am sure, by his name, right? What lot did Lot choose? He chose a lot that pleased his flesh. And he moved in near the city. Just sayin’ here that God calls some to the city, some to the country, some to a foreign field and some to the suburbs, but the bottom line is to be called. Don’t just pick. This choice is so much bigger than our comfort. It is a calling. Lot pitched his tent right next door to some wicked neighbors (God’s word, not mine), well, actually, mine, too, only because God said it. Lot thought that living near wickedness would not have an impact on him. But that choice — that single choice of where he chose to live— impacted his life, his wife’s life, his children, and well, all of Israel. Talk about a choice with impact! Joshua drew a line in the sand and proclaimed it publicly. He was not going to have a secret sinful life. He was going to live out his faith. He pitched his tent near God. He took the portion God had for him, and the land he received is so named. Such a reminder that our choices matter. The land Joshua chose was a reminder of how God used him. (Check this out in the story of Joshua asking God to make the sun stand still). The land he inherited is called: Timnath-serah, which means, “The portion that remains”, or “The portion of the sun”. (Biblestudytools.com). Joshua obeyed and took God’s plan and portion. He did not selfishly seek out a portion for himself. Wow. How about us? Where has God called us? Is our tent pitched near God, as well? We have an incredible inheritance in Christ. But it must be guarded. Lived out. Daily. Moment by moment. Sometimes the world can influence us and we start to drift. This is when we need to hammer our tent pegs in deeper into the foundation on which we have laid our lives. What choices are you making in your daily lives? Do they reflect your faith? It is not where we live or what we profess to believe that truly matters, but HOW we live. Our world throws the word choice out there like it is a right. It is a privilege. But some things God has not given us permission to choose. Will we keep our tent in God’s territory, or the enemy’s? Will we use our voice to proclaim his love and truth to a lost world? It is easy to be influenced by our culture. God is calling us to influence the culture in a way they can receive. Will we do it? We cannot choose to murder the unborn and be right in God’s eyes. A right does not make it right. Abortion might be legalized in man’s eyes, but it is not in God’s. Each life is precious. Let me say here that if you have chosen abortion in the past, there is forgiveness for you. God loves you. We can all be deceived by the choices the world makes available to us. We cannot choose to change our gender. We can change the outside, but God still made us just as we are. He doesn’t make mistakes, but this fallen world sure can harm us. Our God is with us to help us choose rightly. The same deeds classified as sins thousands of years ago still are sin. God is not confusing. We just need to get into His word. And there is hope. We all have sinful inclinations, but we have a God who leads us away from them. We don’t have to wear labels that our society gives to us as a “choice”. Resist the enemy and he will flee you. Friends, God has already defined us and is the author of life. Don’t believe the lie that accuses God. He loved you so much that He laid down His life to bear your sins and struggles and He wants a relationship with you. Will we live out the choice we made to serve and live for God? Or will be live for this world? The choice is ours. What camp are you in, friends? 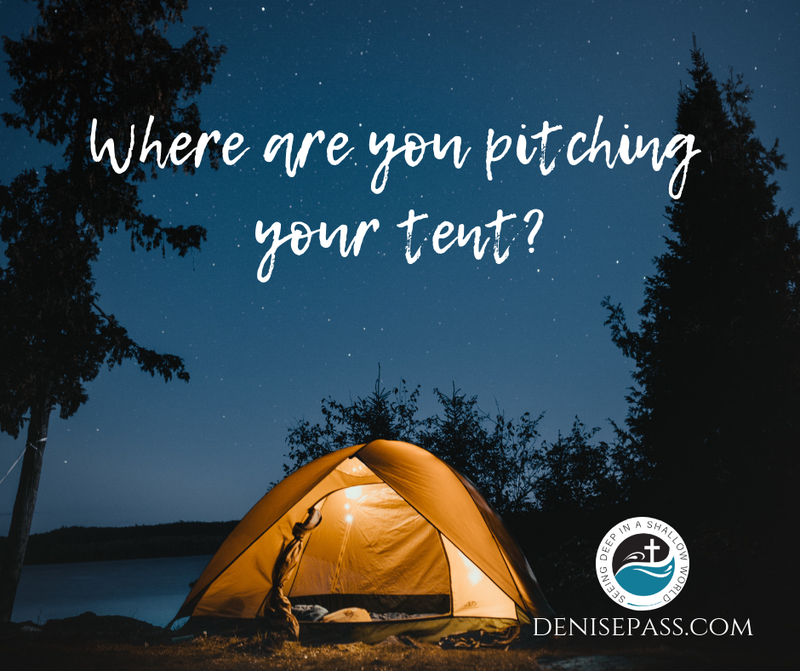 And where are you pitching your tent? Let’s choose this day whom you will serve, friends, and bring as many with us as we can. This month, on my Black and White podcast, we are seeking to address the gender confusion and gay agenda. I pray it is received in the intention it was recorded—full of truth and grace. We also have author Caleb Kaltenbach on the final two weeks of this month. Look for the first episode on 2/6/19. Be blessed, y’all! God is calling us to see deeper in a fallen world and sometimes it gets messy. But we still need to be that voice for His glory!